We don't plant in rows, rather we plant in plots. Our plots are usually manageable rectangles of 4 ft deep x 8 ft wide. We never leave enough space to have comfortable walk paths once the plants get big. Every year, we underestimate the space we'll need between those plots. Seems fine while the plants are small but once they reach full size, it's like a jungle in our garden. I think it works out okay though. We definitely get the most "bang for our buck" by planting as much as possible in our space. Plot style planting (I've heard it referred to as "square foot" planting) is a very efficient method of planting. It conserves water, saves space and reduces weeding if done properly. Unfortunately, most seed packets come with instructions for planting in rows. 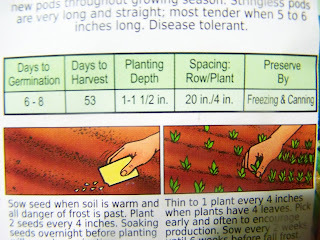 If you will look at the photo below you will find helpful information, such as "Days to Germination", "Days to Harvest", "Planting Depth", "Spacing: Row/Plant", and "Preserve By". 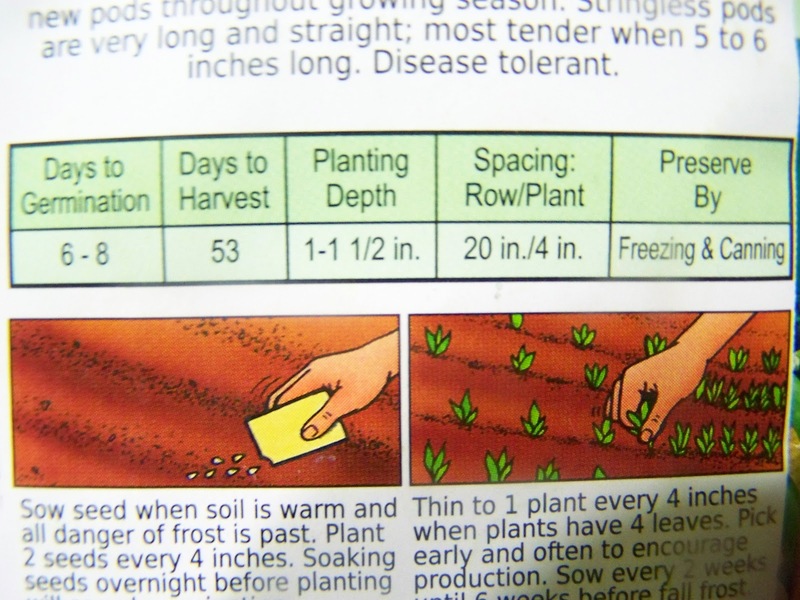 This particular seed packet (green beans) instructs you to plant the seeds at a depth of 1 to 1 1/2 inches. 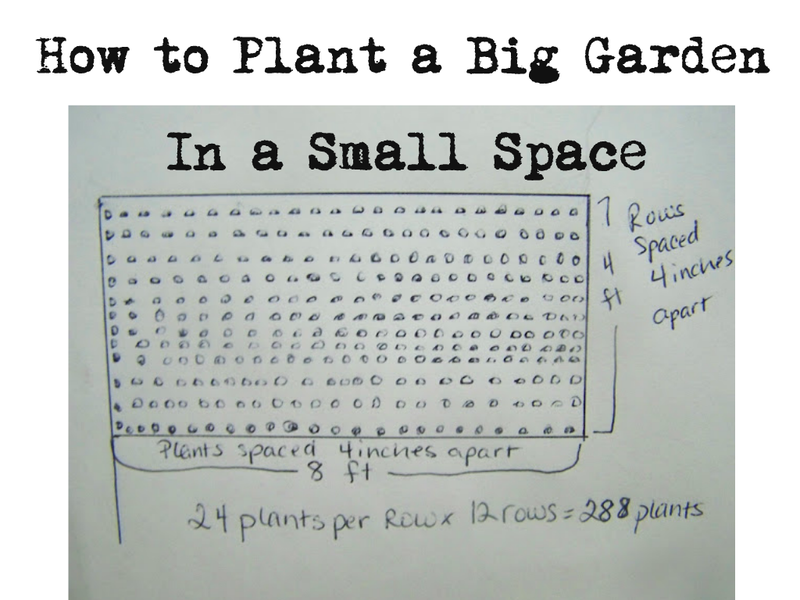 It also tells you to plant each plant 4 inches apart, and to place the rows 20 inches apart. 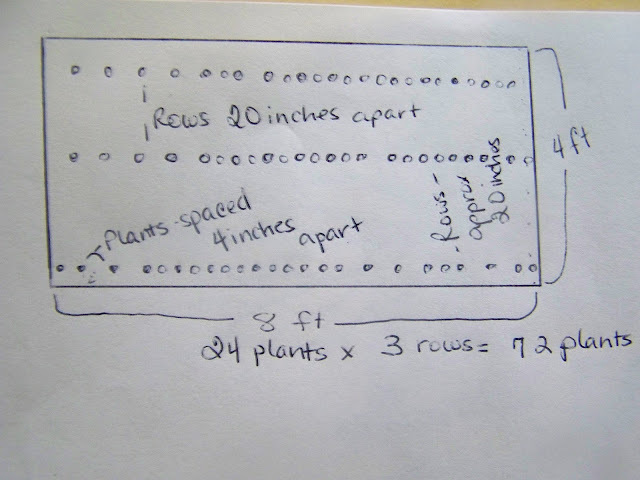 Or, if you plant as we have been, you can space the plants 4 inches apart and space the rows 4 inches apart. 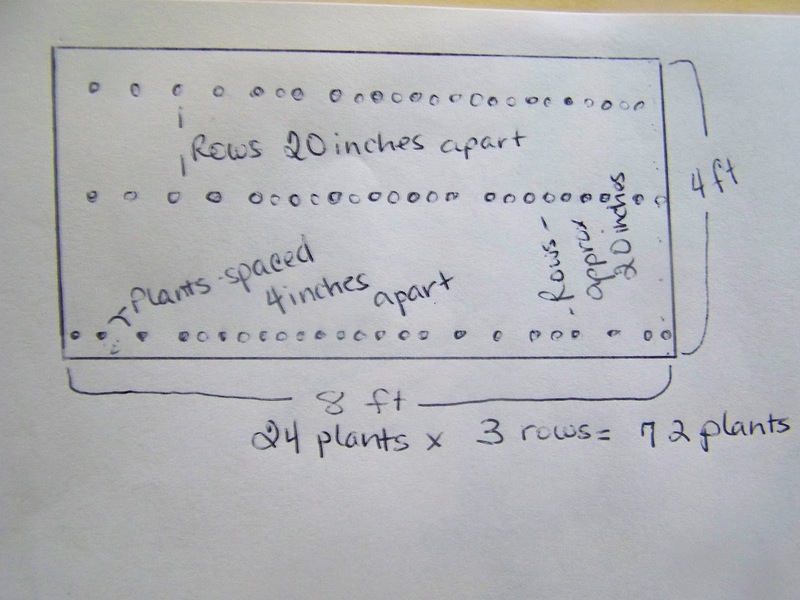 You will be making a grid with your plants. It will look something like this. 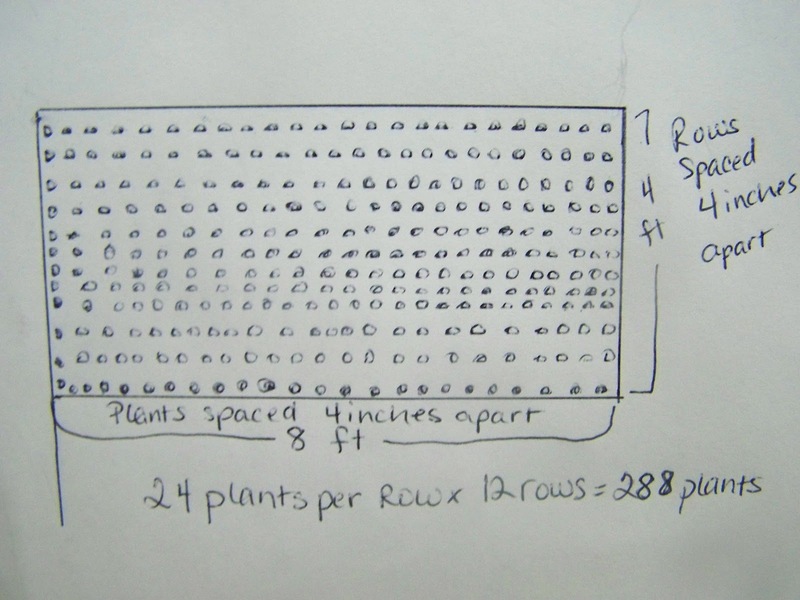 ﻿﻿As you can see, the "Plot" method allows you to plant 4 times as many green bean plants in this example. Not only does this give you so much more harvest for your land space, there are other benefits as well. Because the plants are so close together, the folage actually shields the soil from the sun. This natural umbrella helps reduce the rate of water evaporation. We've noticed that we can generally reduce the frequency that we water our garden by half. The leaves hold moisture into the soil but an added perk is the barrier that prevents the weeds from seeing the light of day. Early weeding will likely be necessary but done properly, you shouldn't have to weed much as your plants mature, except in the pathways. This method really works for just about any veggie. 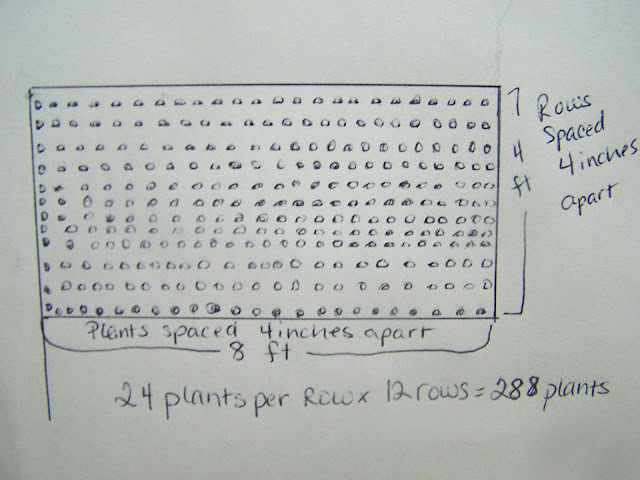 Just pay attention to the spacing required between plants and plant in a grid. (Forget the row distance). I encourage you to give it a try! I'd love to see photos and hear how the plot method worked for you! I am soooo exited about all this - in a month I will start to plan myself!!! :) I'll try to use your tips, too. Let's see how it works out! I can't wait to hear how it goes for you! You won't be disappointed with the plot planting! Keep me posted! Thanks again for sayin' 'hey'! The Cheesy Grits were out of this world! Nothing left afterwards! Thanks for stopping in! I see we're practically neighbors! 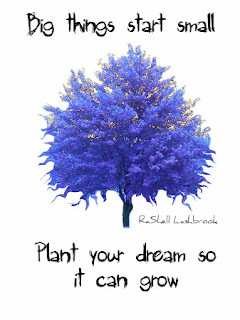 Your garden plans make me dream of spring.... we are several months away from gardening season on our farm. Your blog is lovely--it is nice to meet you! It would be nice if they had both row and plot labeling. You are quite correct with rows being so wasteful. They also give you the impression that you can walk in them to no plant detriment which we know is false due to compacted soil.